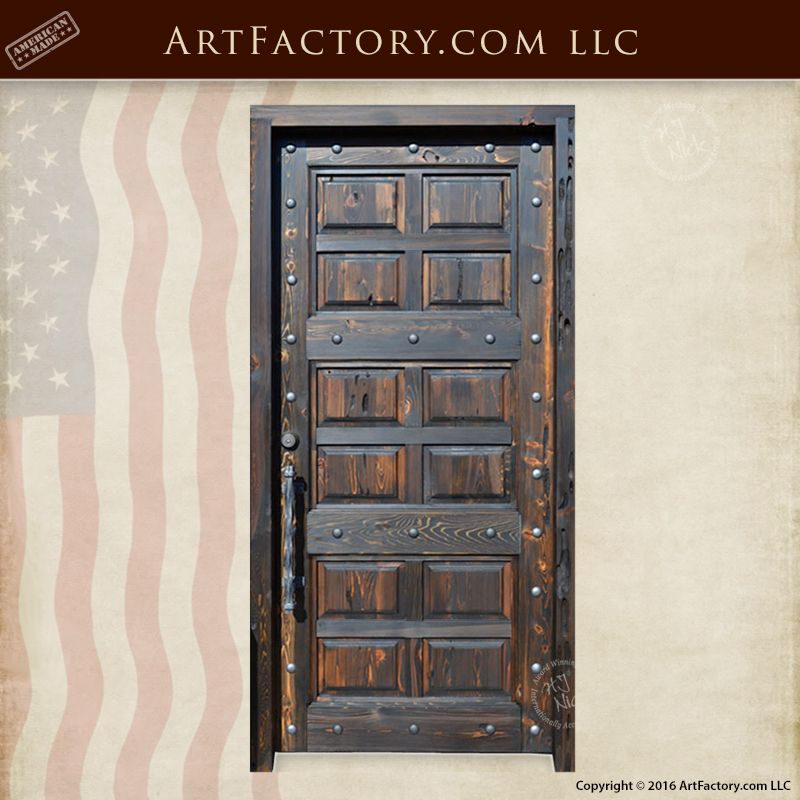 This handmade raised panel wood door is handmade by master level craftsmen at ArtFactory.com. We built this door from solid, thick, full length, naturally air dried wood, and built with hand hewn, mortise and tenon joined construction. This raised panel wood door features a 12 panel, raised molding design, reminiscent of old world castles. It is also built using the same techniques and materials used to build old world castle doors. All of our doors come with custom, hand forged, wrought iron hardware. This includes castle inspired hardware, such as, blacksmith hammered decorative clavos and custom door handle created from solid hand forged wrought iron. The raised panel wood door, as pictured, features our popular custom medieval castle door handle. We offer wrought iron door pulls customized in any size or style that you choose. Choose from our hundreds of styles of custom door handles or theme door pulls, or have our designers create one for you. All of our custom door hardware products hand hammered into shape by master blacksmiths over a coal fired forge. Blacksmith hand forged wrought iron makes for a grill that provides an unmatched level of security. As with all of our custom doors, your hardware options are fully customizable. This customer chose to add decorative wrought iron calves as an accent element to complete the rustic feel of this design. Our time consuming, hand applied finish process makes for a finish that becomes part of the wood, and will stand the test of time with little or no maintenance. Our stain finishes will never fade, flake, chip, or crack like paints and powder coats. This is an exquisitely designed, fine art quality, genuine, solid wood door. Our combination of the finest all natural materials, and master hand craftsmanship allow for us to offer a quality of product that is unsurpassed anywhere else, at any price. These are not only investment quality doors, they are an appreciable asset that will add to your financial net worth. In the eyes of your family, they will become a cherished artifact, and a priceless piece of immortality that will be tangible for generations. It will serve as a way to celebrate your life, and its direct effects on who they are and what your influence was on your family's history. True artifacts enhance and enrich all of our lives in a way that mass-produced merchandise never will, thus preserving the best of mankind and expressing our love for each other. Don't settle for low quality, mass productions doors sold a big box retailers. Own a genuine work of fine art that will add to the value of your property. and become a cherished family heirloom. In fact, if it were not for these artifacts, it would be impossible to know these people ever existed, how they were important to history. This is also the case in the 21st century within your own family. No matter if it’s a simple, hope chest with your personal message or name as a gift to a loved one, or extravagant, fine art quality, master handcrafted custom raised panel solid wood door, these items will be important to the story of your family history long after we are gone. A product is never signed by H.J. Nick until it has first been found to meet all world class fine art criteria. It is our belief that our combination of top quality materials and master hand craftsmanship allow us to offer a quality of product that is unmatched anywhere, at any price. In fact, we are so confident in the quality of our products and craftsmanship that we guarantee everything forever. Most importantly, every product that we sell is manufactured in the USA, at our Scottsdale, Arizona factory. When we say made in the USA, we mean it, just as we have since 1913. When nothing but the best will do, call us at 1-800-292-0008 to speak with one of our talented design engineers. Get a quote for a custom raised panel wood door, or any of our other fine art quality products today.